Today I attended the Authors Guild protest in New York City, and turnout was good. There were about 100 protesters in all, many who are blind or have sight impairments, along with representatives from the International Dyslexia Association. 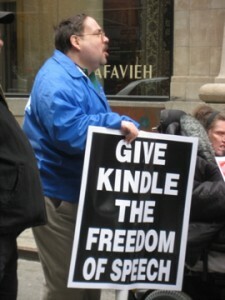 The protesters teamed up with the Reading Rights Coalition to press the Guild to allow books to be made available in audio versions for use on Amazon’s Kindle 2. The Kindle debuted with text-to-speech capabilities but met resistance from authors and publishers over copyrights. For the protesters, the event was a demonstration for equal access to books, which the Coalition says blind people have fought for many years to get, without much success. In addition to the content, the protesters also want the devices that support text-to-speech as well as audio menus and controls for people with sight disabilities. “It’s about equal access to technology and information,” said Nancy Pitt, a protester who is blind. The access issue is somewhat murky; a lot of finger-pointing is going on and nobody is really taking any blame. Case in point: Nobody from the Guild showed up at the protest, prompting cries of “Come on down from the Seventh Floor!” from protesters. Publishers say the decision is up to the authors. Authors say they never gave permission to Amazon but would happily provide audio files to a blind audience. Amazon says it’s not a copyright issue in the first place. Still, Amazon doesn’t want to upset authors or publishers, who could yank their books from its shelves. One point is clear: In the digital age, books should be accessible in more than one format to allow for more than one type of reading experience. That’s not just a disability issue, either. While Braille and DAISY versions of books are geared toward blind readers, publishers should consider disseminating all of their works in large print and audio so that the aging population, as well as those with print or mobility disabilities, can use them. “This is really about pressuring the publishers,” said Daniel Goldstein, an attorney for Brown, Goldstein Levy LLP, who represents the National Federation for the Blind. To that end, the NFB and Goldstein sent a letter to the six major publishing houses asking them to work with their authors to enable text-to-speech on the Amazon Kindle. The Reading Rights Coalition’s next step is an appearance at the Los Angeles Book Fair in April, where 450 publishers will show their wares. The NFB has successfully sued large retailers in the past, including Target; Goldstein says a lawsuit is not in the works, but didn’t rule it out. So far, only Random House has removed the text-to-speech options on its books. But the Kindle has opened a either an opportunity — or a can of worms, depending on your point of view — for making content more accessible to people with disabilities. If every single book came with three or more formats then access would be truly equal to all.